Hello there and HAPPY BIRTHDAY BEKKA!!!!!!!!!!!!!! I am a bit late posting this so I will be quick before the day passes. Bekka is one of my carrer minded Passionettes, she is a fabulous demo and a fearless team leader, I said it before I am truly lucky to have her part of this team, I love her dearly and I was so happy to get to see her today and personally wish her a Happy Birthday even if only for a short half an hour. Everyone that knows Bekka will know of her love for owls and the colour teal, so I had to combine the two for her special card. Here it is.. I used Taken with Teal, Rose Red, Pumpkin Pie, So Saffron the inspiration for this colour combo came from the wonderful Sweet Pea paper stack. 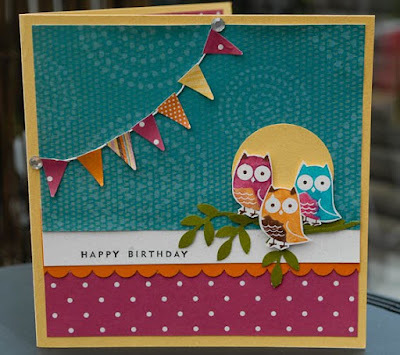 I love it how colourful this ended up, a really bright and happy card, those 2 tone little owls form the Fox and Friends stamp set are so darn cute. And guess what? 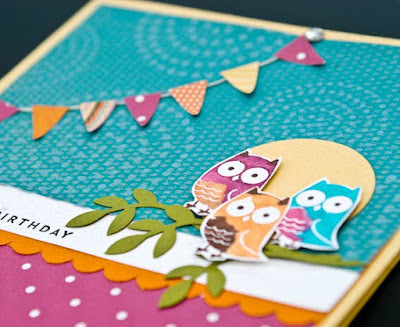 I have a video that shows how I made this card !! So creative! I love the bunting created from the star punch. Owls are fun. 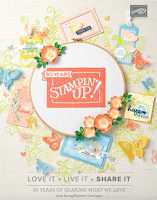 Great tutorial - love the bunting !! Gorgeous! Wish I'd seen your tutorial before getting my ladies to snip bunting by hand in a scrapbooking class!